SPX has continued to be more fun than a backyard lava fountain, but decidedly less spectacular. Frankly, if I had been trying to do much trading during the past month or so, I would probably hate this market. As it sits, I decided to step back a bit when things got squirrely at the start of May, so I'm mainly just getting bored with this choppy pattern. Since May 29, the market has moved higher primarily via overnight gaps, but then just grinds around when the cash session opens. 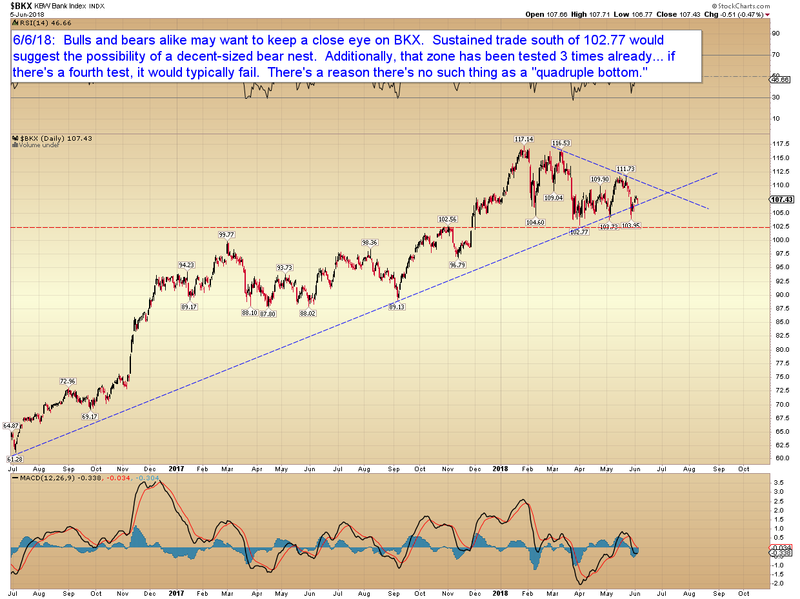 This is a good recipe for a pending strong move in one direction or the other. 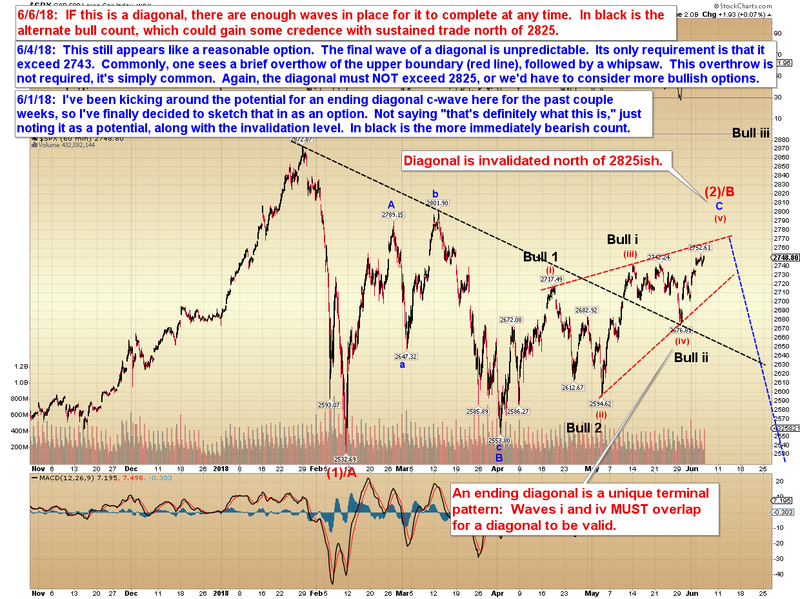 The lack of daily progress suggest bulls and bears fighting it out; so when one side finally runs out of firepower, the market should have room to run against the losing side. The pattern between the red lines below is typically bi-modal as a result. It appears to be either a bearish ending diagonal terminal pattern, which would typically retrace to the bottom of red (ii) in one-third to one-half the time it took to form (the clock starts when it completes), or a bull nest (a strong launchpad). Again, 2825 appears to be the dividing line. Some readers have asked about whether the Russell 2000's (RUT) new highs mean that SPX is "certain to make new highs too!" But that's a somewhat misguided look at things. There's a reason that most analysts don't use the RUT as their guide for the broad market -- the dollar volume traded in RUT is extremely low compared to SPX. 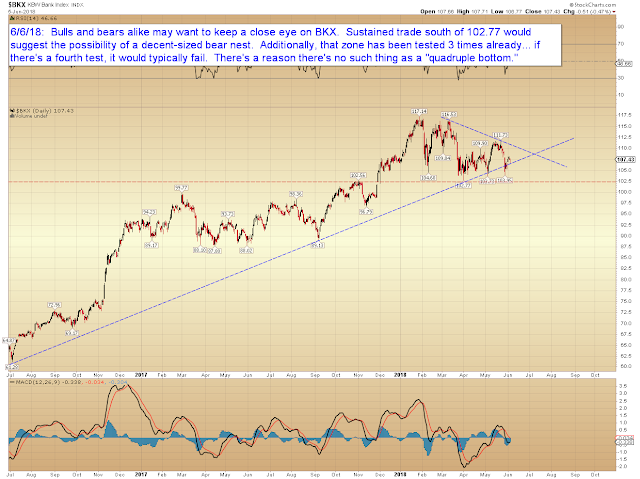 It is worth mentioning, though, that INDU still hasn't exceeded its May highs. In conclusion, we'll continue favoring the ending diagonal by a narrow margin unless and until the market tells us not to. Trade safe.